Step 1 Stir together 1 can of the coconut milk (2 cups) and the probiotic. If the cream and water in the tin are separating, you may want to toss it in the blender or warm it over low heat first and then whisk in the probiotic. Step 2 Transfer to your jar and fasten the lid loosely. Step 3 Let it sit at room temperature for 18-24 hours. You can taste periodically with a clean spoon until the desired taste is achieved. 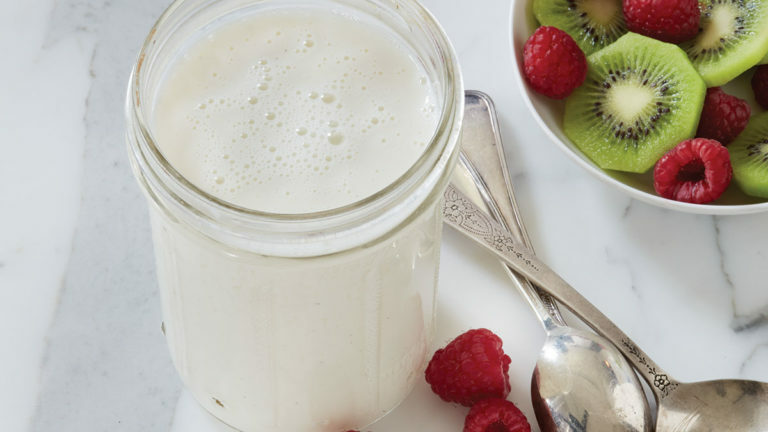 Step 4 Once ready, reserve ½ cup of coconut kefir for your next batch in a new Mason jar. Place your coconut kefir in the fridge. Step 5 Will keep 3-4 days, or freeze for a couple of weeks. Best Health tip: You can continue making coconut kefir following this method. You'll find after two or three times, it gets thicker and creamier. Traditionally, starter cultures can continue on forever, however, if you notice mould form, that's a sign it's time to pitch the batch and start over. Want to make a second batch? Mix together your reserved ½ cup of coconut kefir with 1 can (2 cups) organic full fat coconut milk. Repeat steps 2-5 above. Ready to take your morning nosh to the next level? Meet the seldom bragged about, humble delight that you can make on your kitchen counter overnight: coconut kefir. Think of it as a cross between coconut milk, which it’s made from, and the creamiest, smoothest yogurt you’ve ever had. It’s a bit like your usual yogurt having a spring break fling with a piña colada. It’s creamy and coconutty, but best of all, it’s a powerhouse of probiotics and has some incredible health benefits.